Once upon a time our Head Chef was doing a spot of babysitting and decided to teach the toddlers how to recognise the various stages of cooked pasta. One experiment involved throwing spaghetti at the wall to see it stick. The toddlers loved it, but he wasn’t asked to babysit anymore. 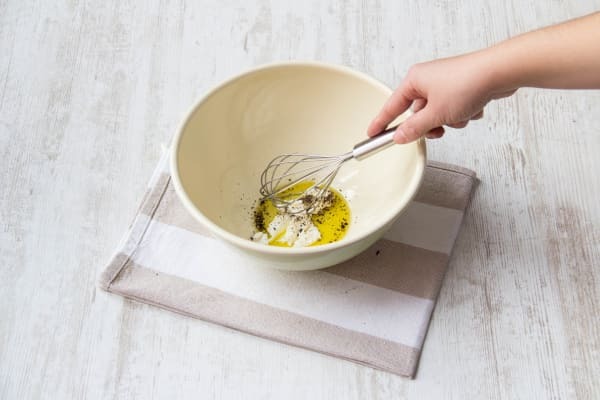 Another fun cooking tip is a homemade salad spinner (see below). Just make sure the grown-ups aren’t home. Boil a large pot of water with 1/4 tsp of salt and pre-heat your oven to 220 degrees. Wash the new potatoes and the spinach. Cut the potatoes into quarters and cook in the boiling water for 15 mins or until tender then drain. Mix the breadcrumbs with the grated cheese the garlic salt and a good few grinds of black pepper. 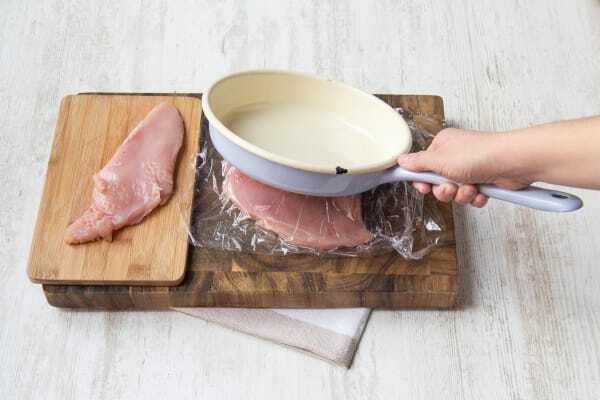 Sandwich your chicken breasts between two pieces of cling film (if you have some). Bash the chicken with a rolling pin until it is 1cm thick all over. Tip: If you don’t have a rolling pin you can improvise with a heavy saucepan/cricket bat etc. Spread 1 tbsp of sour cream over each piece of chicken. 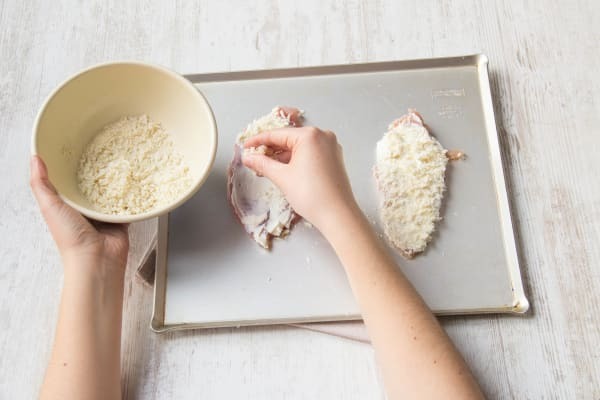 Coat in the cheesy breadcrumb mixture and lay on a lightly greased baking tray. Cook on the top shelf of the oven for 15-20 mins or until the chicken is cooked through and the coating is crispy. Tip: The chicken is cooked when it is no longer pink in the middle. Make a dressing with 1 tbsp of the sour cream and 2 tbsp of olive oil, ¼ tsp of salt and some black pepper. Sit back and relax whilst your chicken cooks! 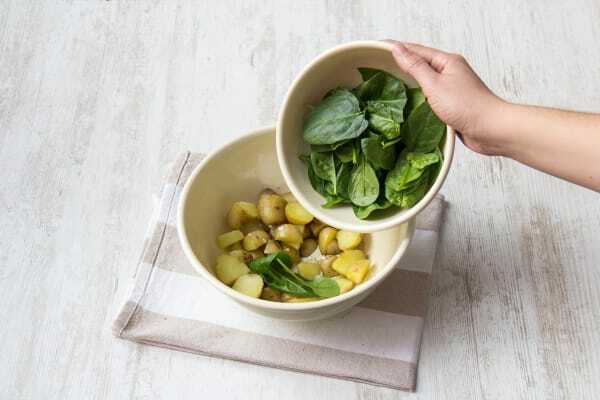 Toss the cooked new potatoes together with the spinach and the dressing. Tip: To dry off the spinach use a salad spinner or you can even place it in a tea towel, hold the four corners together and spin it round your head super fast! 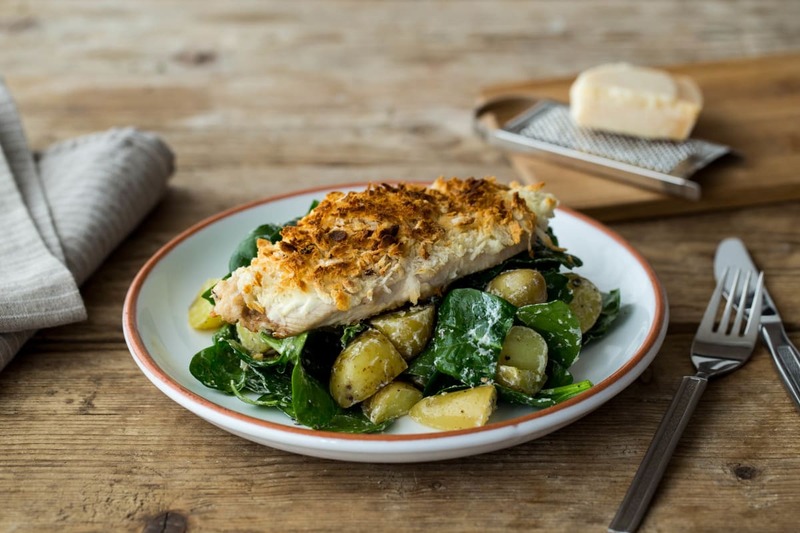 Pile the potato and spinach salad on your plates and top with the crispy chicken breasts. Serve with lemon wedges.